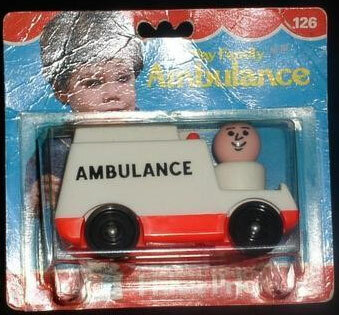 Description: This is an Original Little People Ambulance set. 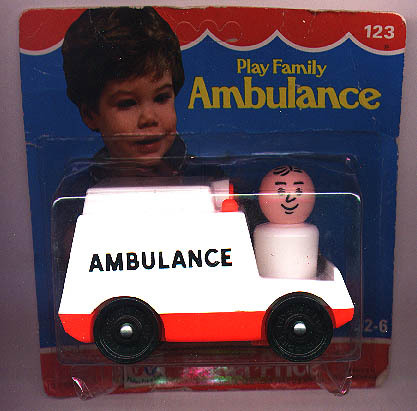 The set includes a small Ambulance vehicle and a doctor. Although this set was usually sold with a Caucasian doctor, it has also been seen with an African-American doctor. 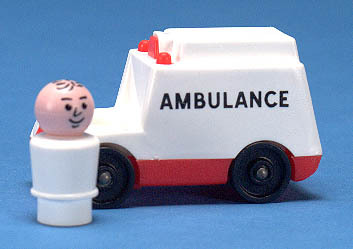 FPT441 - White Ambulance vehicle with a red base, a red siren on top, and "Ambulance" heat-stamped in black on the side. Wheels marked "Fisher-Price Toys". ELPP - Doctor with a white body and black heat-stamped hair. EMPP - 1981 Dealer Catalogue shows this set with an African-American Doctor with a white body and black heat-stamped hair. FPT442 - White Ambulance vehicle with a red base, a red siren on top, and "Ambulance" heat-stamped in black on the side. Wheels NOT marked. FP123SET1978 - (Complete set in blister pack) - This set was first introduced in 1978, but was marked #123. It didn't receive it's individual part number until 1979. A mint Ambulance set marked #123 is very rare and more valuable than a mint set marked #126. MINT ON CARD (card marked "123"). WFL: 07-AN-02-0-A. FP126SET1979 - (Complete set in blister pack) - This set was sold in a 5-1/2" high x 6" wide blister pack, and was also available in #123 Play Family Vehicle Assortment.